Need to find a mod to switch Hitler's face for Juncker and the German Reich flag for the EU flag. 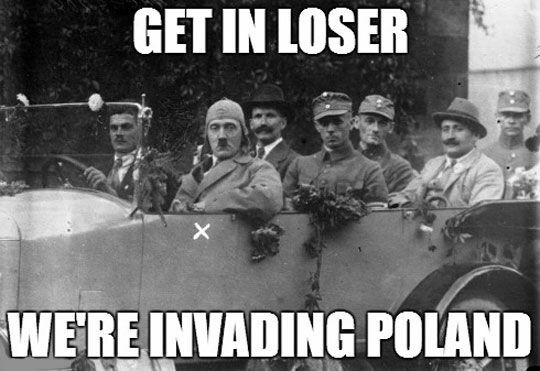 Then I feel the urge to invade Poland, to uphold European values. Maybe we can lasso Nero into the game to play your ally in Finland? I saw a new mod for the HoI4 that made me think of you. The mod is rather small in size. The mod name (and I think its sole purpose) is "Falklands renamed to 'the Islands Argentina will never get' ". I might have some time as well. I hit up my mate finally, the guy who plays the UK a lot. He's in, but not for 3 weeks or so. Not that that rules out a game previously without him ofc. We need some more warm bodies! I assume Chijo is the one to watch now as I see him on Steam playing HOI4 all the time. I am still up for a game as well. I think I saw somewhere that in the last Dev Diary they said something along the lines of ‘in about a week we will be announcing a release date for the DLC’.